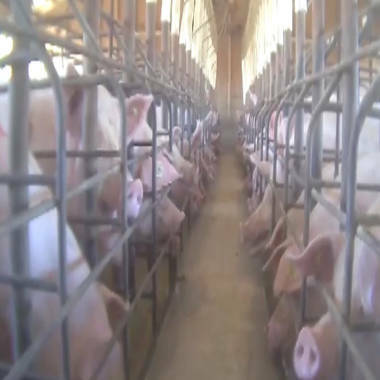 The nation’s largest meat producer says it has terminated its contract with an Oklahoma farm after NBC News showed the company undercover video of workers on the farm kicking, hitting and throwing pigs and slamming piglets into the ground. The owner of the farm said that the video showed "mistreatment" of animals and he had taken action of his own. “I was stunned that anyone could be that callous in their treatment of any animal," said Lonnie Herring. "After viewing the video, I immediately returned to my farm and terminated the employees seen in the video." Tyson Foods owns the sows and boars on the farm, while Herring owns the farm itself and provides meat to Tyson under contract. After reviewing the Mercy for Animals video, he said he had "a renewed commitment to animal care" and planned to pay more attention to activity on the farm. "I can do better than this video shows and will do better in the future," said Herring. Paul Sundberg, vice president for science and technology at the National Pork Board, a marketing group overseen by the federal Agriculture Department, explained that blunt force euthanasia is “common industry practice,” and that euthanasia was sometimes necessary because of ill health. "During pork production,” said Sundberg, “there are times when animals become disadvantaged, meaning sick or injured, where the humane thing to do is euthanize them. I am a veterinarian -- I was in practice for nine years -- and in my experience there are things we can't treat." According to the Oklahoma Pork Council, there are no specific state laws pertaining to the treatment of animals on hog farms. Farmers must adhere to "industry standards" set by the American Veterinary Medical Association. According to the AVMA, blunt force trauma is effective because the frontal bones of the piglets’ skulls are not fully developed and they can be killed with a single sharp blow to the head. Runkle countered that “slamming baby piglets into the ground can cause prolonged pain,” and that some animals survive for hours. Maxey Reilly, assistant district attorney for Okfuskee County, said she had seen information provided by Mercy for Animals, and that a legal representative for the group had asked her about filing animal cruelty charges, but that she wanted to learn more about industry standards. “Until I’ve reviewed everything and done some independent research, I’m not ready to make a decision,” said Reilly. “If I do decide this warrants more action, I will still mount an independent investigation. I don’t want to be pressured into doing something that’s not right."